Redlands United came from a goal down in the second half to edge out FNQ Heat 3-2 in a see-sawing encounter at Barlow Park in Cairns on Saturday. The visitors took the lead early through Igor Sao Jose before finding themselves a goal down following goals from Heat pair Josh Jennison and Alex Smith. However, the Red Devils finished strongly with goals to Lyndon Dykes and Graham Fyfe to record their third straight win in all competitions. 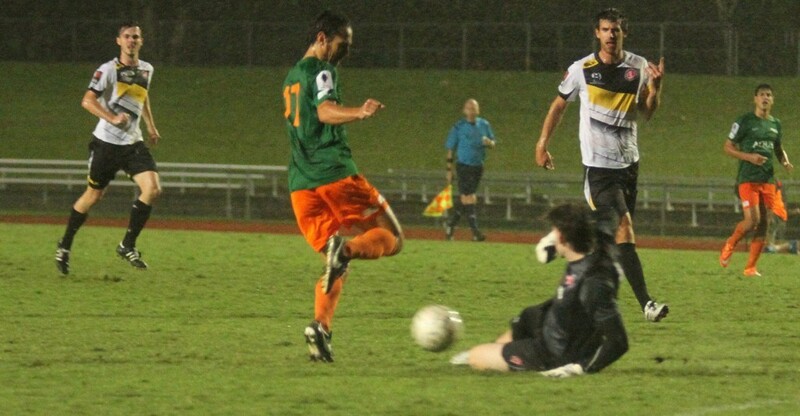 Heat started the contest promisingly in wet conditions and delivered the first opportunity of the night inside ten minutes when Ethan Docherty forced a sharp save from Redlands goalkeeper Brendan White. But it was Redlands that opened accounts just after the quarter hour - Sao Jose slipping in behind the Heat defence and rounding Heat goalkeeper Nicholas Mooney to deliver his third goal of the campaign. White remained busy as he parried away Josh Jennison headed attempt midway through the half before Redlands spurned a pair of chances as Elliott Ronto and Nico Bechar both failed to find the target at the other end. However, Heat sensationally forced an equaliser just prior to the interval as Jennison found the final touch amidst a goal mouth scramble in the final minute of regular time. Two minutes after the restart Heat pulled ahead for the first time as PlayStation ® 4 NPL Queensland Golden Boot leader Smith saw his benign corner kick inexplicably fumbled into the goal by White. The two sides continued to exchange chances as Carroll and Bechar both found the target approaching the hour before Dykes delivered the second equaliser of the night - the young attacker turning Heat defender Tamas Maffey-Stumpe and slotting home for his first PlayStation 4 NPL Queensland goal. With ten minutes remaining White made amends for his earlier error with a sensational save to deny Smith from the penalty spot. Redlands player-coach Fyfe then delivered the winner in trademark style with a pin-point strike from outside the box into the bottom corner. Speaking post-match, Redlands captain James Donnelly suggested that following a slow start to the season momentum was building for the bayside club. “I think our lads have had character building all season through the tough times and it’s coming through now and we’re getting on to a bit of a roll here,” he said. While Heat coach Martin Docherty lamented his side’s inability to see out the game from a promising position. “Missing the penalty gave them a massive shot of confidence and we basically dropped our bundle,” he said.